I should be posting a Hi Lo today, but this week is NFP Awareness Week, which is an entire week devoted to bringing attention to Natural Family Planning. 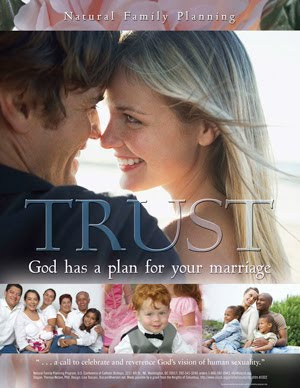 This year, the theme for the week is Trust: God has a Plan for your marriage. I encourage all of you to open your minds to studying and using Natural Family Planning. It's good for yourbody and soul! And find lots more here! Hello. I was on Katie Cervetti's blog and I somehow found yours. I am Katie's younger sister. My mom is trained in NFP the ovulation method. Which city do you live in? We are in Ames IA.